FENOMENO is an integrative project aiming at an understanding of the impact of end-of-life manufactured nanomaterials (MNMs) on the environment. 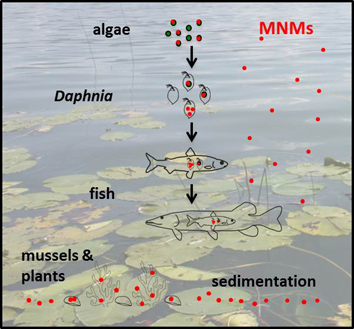 Even though MNMs are mostly removed during wastewater treatment (WWT), the remaining MNM levels in the effluents are significant and MNMs may show an increased toxicity for aquatic organisms due to their modification during the WWT. With innovative analytical approaches we study the fate and effect of wastewater-borne MNMs in an aquatic ecosystem, develop the basis for robust evaluation systems, and design analytical sensor systems for quantitative nanoparticle detection using biochemical markers and Daphnia and fish as sensors. We use cutting edge approaches to analyse and monitor the biological impact of TiO2 and Ag MNMs on different trophic levels within a relevant food chain (algae-Daphnia-fish) at different levels, from behavioural to biochemical, from laboratory to complementary field studies. FENOMENO receives funding in the FP7 ERA-NET on Nanosafety: Safe Implementation of Innovative Nanoscience and Nanotechnology (SIINN) (http://www.siinn.eu/en/).